Strange cigar-shaped ‘Asteroid’ is first interstellar visitor to our solar system! Last month, the Pan-STARRS 1 telescope in Hawai'i picked up a very strange object moving across the sky. It was originally believed that the object was a comet but astronomers quickly realized it was something entirely different. 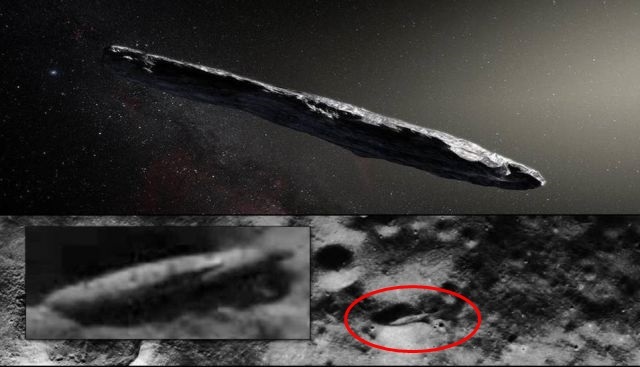 Above image shows an impression of cigar-shaped asteroid Oumuamua - European Southern Observatory / M. Kornmesser and a cigar-shaped UFO on the backside of the Moon. Observations with ESO's Very Large Telescope and others have shown that the object is a rocky cigar-shaped asteroid and it has been confirmed as the first ever interstellar object to enter our solar system. The object has been dubbed ‘Oumuamua’ by the International Astronomical Union. The name means “a messenger from a far arriving first” in the language of the Central Pacific Island. According to a European Southern Observatory (ESO) Oumuamua is like nothing seen before. It is red, made of dense rock or metal, and is shaped roughly like a giant cigar measuring up to 400 meters long and around 40 meters wide. Oumuamua varies dramatically in brightness by a factor of ten as it spins on its axis every 7.3 hours. This unusually large variation in brightness means that the object with its complex, convolute shape, is highly elongated and may well have been wandering through the Milky Way, unattached to any star system, for hundreds of millions of years before its chance encounter with the Solar System, reports RT. It seems to come from the direction of the star Vega. However, Vega itself moves and was not in the area when Oumuamua was last there about 300,000 years ago. As quickly confirmed by the astronomers the object is an asteroid which became the first ever interstellar object to enter our solar system; but given the very strange shape of the object it reminds me another huge cigar-shaped ‘UFO’ object on the backside of the Moon photographed by the crew of Apollo 15 which is very similar to the cigar-shaped ‘Messenger From A Far Arriving First’! This animation (annotated) shows the path of the interstellar asteroid 1I/2017 (`Oumuamua) through the Solar System. Observations with ESO's Very Large Telescope and others have shown that this unique object is dark, reddish in color and highly elongated. FYI, it's just a meteor. There is absolutely no reason to believe this thing is a single solid object. Rather, it's far more likely to be a string of smaller rocks that are held together by their own gravity -- and which have been stretched into that elongated oblong shape by passing by a gravity source of some kind. Sadly, artist renditions are being taken to be actual photographic evidence -- and telescopic data is being analyzed without regard to what all else we know about space objects. Harvard so called "scientists" are actually claiming this thing was sent here by aliens. Another ploy to bring attention to themselves so they can enrich themselves with articles, books, interviews and grant money to support phony projects. Another low standard set by Harvard.